Jason Voorhees from Freddy vs. Jason is the next Friday the 13th figure to be announced by NECA. This new Ultimate Jason figure stands at 7" tall and looks exactly how he was shown in the legendary horror crossover movie. Like similar releases, he will come in NECA's collector-friendly window box packaging with an opening flap, showing off the figure's beautiful details while remaining pristine. Due to arrive this summer, the Freddy vs. Jason Ultimate Jason figure was officially unveiled today by the popular toy company on social media, and no matter where this entry might stand in your personal rankings of Friday the 13th movies, you've got to admit that this figure looks totally awesome. Like any good NECA figure, this new Jason comes with many different accessories. For starters, this Jason can be unmasked, rather than simply having alternate heads. Under the mask, we can see Jason's grotesque face in much better detail than we could in the actual movie. He does come with three different masks, however, each coming from different scenes in the movie. This includes his regular mask shown at the start, a mask damaged by Freddy's razor claws, and the bloody mask worn by Jason in his ultimate showdown with Freddy at Crystal Lake. Jason also comes with two machetes, a fire effect attachment, and even a cute little teddy bear. Released in 2003, Freddy vs. Jason was directed by Bride of Chucky helmer Ronny Yu. While veteran Jason Voorhees actor Kane Hodder was replaced in the role with stuntman Ken Kirzinger, Robert Englund reprised the role of Freddy Krueger in the movie for his final film appearance. The movie had been brewing in development hell for many years before finally coming to fruition, and now forever has its place in horror movie lore. Opinions on the film are split between both Friday the 13th and A Nightmare on Elm Street fans, but like many installments from both series, it has a cult following of its own that remembers the movie fondly. It seems that NECA is currently in the process of giving every Friday the 13th movie's Jason the Ultimate Jason toy treatment. The "dream sequence" Jason shown in A New Beginning was recently released, and new Ultimate Jason figures for Jason Lives and the 2009 reboot have been announced as well. Even Roy Burns, the copycat killer who wears the trademark hockey mask in A New Beginning, has an action figure from NECA in the works. While removing them from the packaging might seem like a sin for some collectors, imagine how awesome it would be to see each of the Jasons all lined up in a row on your shelf. 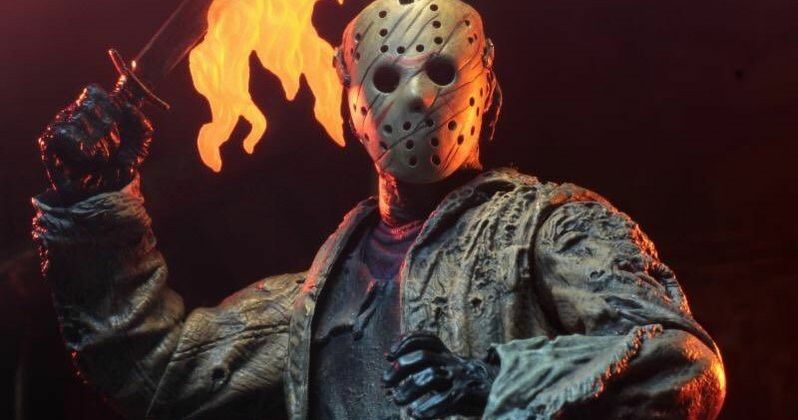 The Ultimate Jason from Freddy vs. Jason figure is set to release in July 2019. For those who loved the crossover movie and for diehard collectors trying to nab every NECA Jason, it goes without saying that this figure is a must-buy collectable. Keep the awesome horror figures coming, NECA! You can take a look at the new figure's announcement in the tweet below, and you can see more pictures at NECA Online.